When Allegiant was released, I heard a number of reviews, mostly disappointment over the ending. I won't spoil the ending for you, but I was hesitant to read this book because I knew the ending beforehand. And so I delayed reading Allegiant for quite a while until now and I must say I think people overreacted. Yes, it was a very sad ending, but at the same time the divergent series wasn't a fairytale that needs a happily ever after. I think the ending made it more realistic and I don't think it would be fitting otherwise. I've read the series like evry other divergent fan and adored the movie (especially Theo James as Four). In Allegiant we see that the group living in Chicago have snuck outside to the outside world, where they believed that they could help those that need it; as per Edith Prior's video. ‎Little do they know that their lives have been lies and there is more danger inside Chicago than outside. The Bureau used them all as part of their experiments, never interfering when there was trouble and wars and only when there appeared to be danger to Divergents did they intervene. 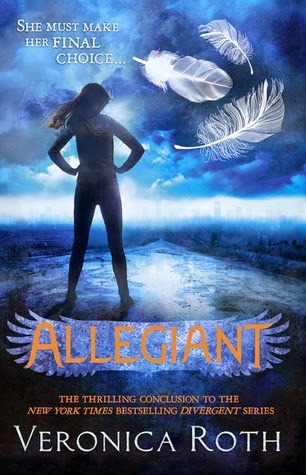 Tris, Four, Christina and the others aren't sure where they stand and what they need to do. Although there are no factions on the outside, everyone is divided as a 'genetically damaged' (GD) or a 'genetically pure' (GP). What's worse is that Tris is GP and Four is GD, which creates rifts in their relationships because Tris doesn't believe there's anything wrong with him, and Four has received confirmation of something he's always known; that he's broken/damaged. Again, there's a lot of fighting and deaths but we do see some rare, cute scenes bet‎ween Tris and Four. I guess this was a miserable end to the series but I still loved it although I'm sad to see it end! "You're not very nice," I say grinning. He smiles, his teeth a flash in the dark. "I like this 'nice' thing." Why do you care? I ask myself. He betrayed you. He didn't try to stop your execution. I don't care‎. I do care. I don't know. I thought that when I received Christina's forgiveness, the hard part of Will's death would be over. But when you kill someone you love, the hard part is never over. It just gets easier to distract yourself from what you've done. "You know what Mom told me once?" he says, and the way he says Mom, like he didn't betray her, sets my teeth on edge. "She said that everyone has some evil inside them, and the first step to loving anyone is to recognize the same evil in ourselves, so we're able to forgive them." To me, when someone wrongs you, you both share the burden of that wrongdoing-the pain of it weighs on both of you. Forgiveness, then, means choosing to bear the full weight all by yourself. People talk about the pain of grief, but I don’t know what they mean. To me, grief is a devastating numbness, every sensation dulled.